María Blanchard and Fernande Olivier were two brave women, each of them in their own way: one of them fought for creativity and the other fought for freedom. Both came from worlds in which a woman was not able to choose her future, and they did so. Short narration based on their biographies, illustrated live, for families with children from 5 years old. Between 16th February and 30th March each museum organizes a session aimed at the family audience. The project allows the lives of 14 relevant women in art, science or crafts to be recreated through the narration of children's stories written specifically for each session. 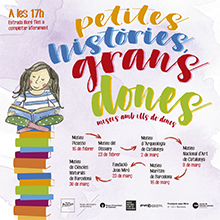 -Activity jointly organised by the Fundació Miró, the Museu d’Arqueologia de Catalunya, the Museu de Ciències Naturals de Barcelona, the Museu del Disseny de Barcelona, the Museu Marítim de Barcelona, the Museu Nacional d’Art de Catalunya and the Museu Picasso, on the occasion of the Month of the Woman 2019-.